I’m the first to admit, I don’t know a lot about beer. As long as it is too dark to see light through, I’m happy. Sometimes though, a relaxed environment, decent pub food, and a beer just hit the spot. 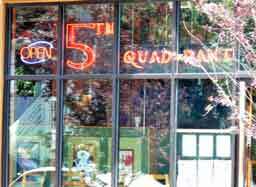 During these recent warm evenings, I’ve been heading to 5th Quadrant, the newest incarnation of the Old Lompoc brewery on N Williams. Owned by the folks behind the New Old Lompoc, the 5th quadrant with its high ceilings, old exposed wood beams and rough concrete floor show its roots as a car repair shop. 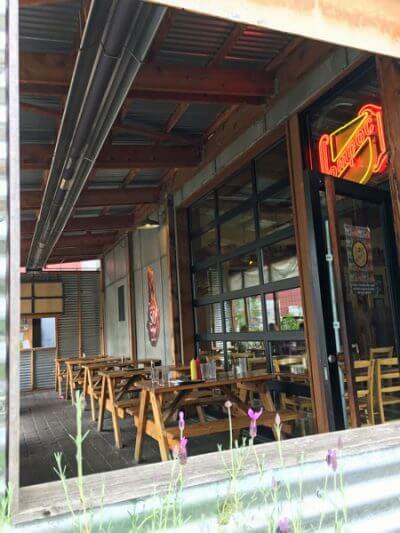 The roll-up garage door is still in place, though replaced by a newer version that opens to a patio on nice days. Lots of the wood trim was recycled from an old Portland house. A unique aspect is the three booths down the center. At first glance, they are just normal tables, but for large parties, the dividing wall rolls up leaving seating large enough for 16 people. The overall feeling is warm in the winter, yet open and airy in the summer. Food portions are quite large and rather upscale for pub food. For instance, take the 5th Quadrant salad. It’s loaded with sweet roasted beets, crunchy hazelnuts, creamy Gorgonzola, good fresh greens, and an excellent, balanced orange vinaigrette dressing. It is one of the better salads of that type I’ve had in a long time. For $9.00 you get a portion so large it’s hard to finish. Another winner is the Italian chopped salad. The lettuce is cut chiffonade style into thin strips before being mixed with salami, kalamata olives, tomatoes, cubes of decent smoked Gouda, and garbanzo beans. The whole thing is tossed in a basil vinaigrette. It’s one of those salads with lots of interesting flavors and textures. There is also a Caesar of romaine hearts and a homemade dressing, but it was a bit bland and didn’t really impress me. Sandwiches are the mainstay at 5th Quadrant, all coming with your choice of soup, salad, fries, or coleslaw. The soups are pretty good, though a recent tomato-basil version had so much cheese on top the entire thing became a bit of a gloppy mess. The fries are excellent; slightly soft with a good sprinkling of sea salt on top, giving little explosive bursts as you bite into them. My first test of any pub is the burger. It’s better than most; a thick ½ pound patty topped with all the normal accouterments, and your choice of smoked Gouda, Swiss or Tillamook cheddar. Juices run out every time you take a bite, if you hold it over the large mound of fries, they’ll soak up all that goodness. The NY strip sandwich can be good if you happen to get a decent cut of meat. The first time it was a bit tough and hard to chew, the second time I liked it much better. It consists of a five-ounce strip, sautéed onions & peppers, mozzarella and garlic mayo on a hoagie roll. It arrives with a steak knife stuck through it to keep the whole thing together. I’ve also tried the BBQ pork sandwich. It comes piled high with pulled pork shoulder and just the right amount of coleslaw. We aren’t talking world-class BBQ here; the sauce could use a bit more character, but it is satisfying. There is also a better than average meatloaf sandwich; grilled with lettuce, tomato, and mayo on whole wheat. After 5:00 pm, there are a few extra entrees; among them, a standard serving of meatloaf on a mound of mashed potatoes, sautéed vegetables and gravy; just like mom used to make. They even suggest the proper beer to go with your entrée. For the vegetarian in your group, the offerings are better than most. I’ve had better eggplant Parmesan, but not in a pub, and the marinara sauce is pretty darn decent. There’s also a portobello sandwich with roasted red peppers and a spicy rémoulade and a Garden Burger. Beer, of course, is the star. I used to always get the stout but kept finding myself passing out on the couch by 9:00 pm. Now I’m going for a slightly lighter Lompoc Strong draft. There are Seasonal beers as well as five others made in house. A selection of “Guest Taps” is also available along with a few macro-brews and a few wines. In addition, 5th Element has hard liquor with a selection of specialty cocktails. I haven’t tried dessert yet; after a couple of beers and the huge portions, there hasn’t been room. Overall, service is excellent, better than a lot of the more expensive restaurants around town. The beer list is, of course, excellent, with something for everybody. Drop by 5th Quadrant and enjoy a cold microbrew. 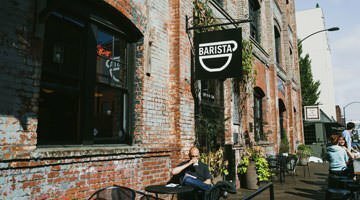 There are plenty of interesting conversations to overhear, the sun feels good on your face, and you’ll enjoy some of the best pub food in Portland. The other locations/incarnations of the New Old Lompoc serve their home brewed root beer (which is seriously delicious, btw). Does the 5th Quadrant serve it as well? When I’m not drinking that, I am a fan of the LSD. Yes they do serve their root beer at this location. There is also a chicken & mushroom pasta dish that is WONDERFUL. Their LSD is quite dangerous! But, hard to resist. I like their Centennial IPA as a lighter alternative. The 5thQ is a good addition to the Lompoc family. I live near the Hedge House (which makes stumbling home from LSD possible), however the food is much better at the 5thQ. The one time I stopped by for a beer refresher during a recent bike ride, behind the bar there were two bins of muddled (marinated?) spirits – a gin with cucumber, and vodka with strawberries. The strawberry concoction looked particularly sinful – cocktails made with either would probably be dynamite. Jill-O: Yes, they have the rootbeer. I tried it last winter and liked it myself; should have put that in the review. Thanks! But Food Dude: the stout is not quite as strong as the LSD: 5.8 a/v to 6.9 a/v. That’s a big jump. The service, especially later on, is just not that great. It’s frustrating. i agree with steve and vj – went for the last time and service was terrible throughout the whole meal. although the food was good, overall it left a poor impression. I’m suprised to hear all the negative comments about the service. I’ve been six times since they opened, and never had bad service. Never great either, just Portland average. I’ll go back on a busy night. FD, I’ve got to side with the others on this, unfortunately. After reading your review, I was craving a burger, so I went with a pal last Friday afternoon. We sat at the bar and experienced the worst service we’d had a long time. The short story: My burger & fries were alright, but my pal’s portobello burger was about as thick as three postcards taped together, and the slaw it came with was a soupy, flavorless mess. Combined with the rude attitude and snail’s pace of the lady working behind the bar, we won’t be going back for a second chance. A very McMenamin’s-ish experience, overall. I’m still going to go there because they have two dollar tuesdays (pints for two bucks after 10, i think) and i LOVE their nachos. But still…service. I think all the comments about service in a pub environment are pretty funny. If you ate that food all time, don’t you think you’d be sluggish, too? Tuesdays it is $2 Pints all evening, But please only have a couple. The yummy Happy Hour food specials only until 6PM I think, but the Pint bargain is all day on Tuesdays. I’ve generally felt comfortable chatting with folks at the Bar. just a bit slower sometimes on very busy nights. There are a couple outdoor tables, and a large patio, enclosed & heated for 4 season use. Restrooms are very clean. There is a well-used Bike Rack. Please try to keep your voice level low here, as the 5thQ can get noisy as patrons get happier. seeing as that 5Q is my neighborhood pub, i have spent some quality time there. i admitt the beer and food are better than most pub fares, but the service is absolutley ridiculous! the slowest in town by a landslide. not only is painfully slow all the time, some of the servers are quite rude. if this place wasnt across the street from my house, i would have no reason to go there. Funny…I just had dinner there on Sunday night and it was great. Service was spot on. The bartender even gave us tastes of the seasonals when we sat down. Food was awesome, one of the best reubens in town. I do have to insert that I am a server, so I am a bit picky, but also more sympathetic. Remember, it is also a bar….many tables are just drinking, so you will not have your standard Olive Garden, four table section service. They just cannot afford that. It would really be nice if people could be patient and understand that you are NOT at a fast food restaurant, there is only ONE bartender to make drinks for the whole place. The rude service though…that is not really cool. I normally agree with Mr. Food Z. Dude, but not on this one. I also live NE, not too far from this place, and after 3 or 4 visits I won’t darken their door again. While it seemed fine the first time, it also got worse with each subsequent visit and my last Q meal — about six months ago with my adult son — was all but inedible. I wish I could say it weren’t so, I enjoy a good pub from time to time and a place to sit outside — in fact, I pen this little scribble from the corner of MLK and Failing where I have been resting in my lawn chair for weeks and weeks, rain and shine, awaiting my Chicago Red Hot. Sigh. My parents actually turned us on to this place. We love it. Even my 7 year old likes their food. That is saying alot as she is extremely picky. My dad loves the burgers. I prefer the lighter fare. The french dip with bleu cheese is nice and the bleu is not overpowering at all. The albacore tuna is delightful. The salads are always wonderful. My husband likes their honey mustard dressing. The waitstaff isn’t warm and fuzzy, but the bartenders are informative and helpful. We drive down from Vancouver often. It isn’t a place to grab a quick bite. They don’t rush you out either. It is a nice place to sit and enjoy a meal. A good fresh sandwich sounds great… especially when you make the fries that go with it seem so amazing!